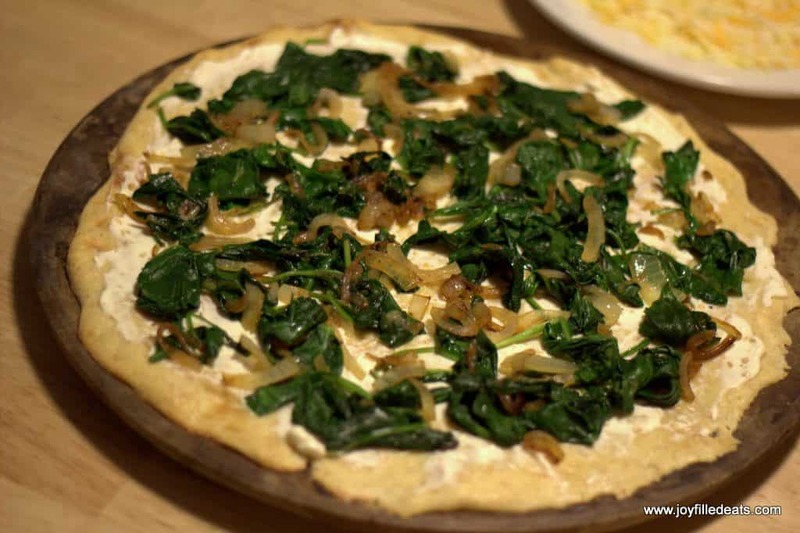 This low carb White Spinach Keto Pizza is topped with a creamy garlic sauce, four kinds of cheese, sauteed onions, & spinach. 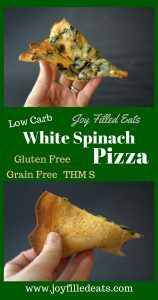 It is gluten free, grain free, & THM S.
I’ve tried a lot of low carb pizzas over the years. Cauliflower crusts, meatzas, coconut crusts, low carb flatbreads, and tortillas as crusts, you name it and I’ve tried it. What saved keto pizza for me was the melted mozzarella cheese dough. I first saw a melted mozzarella dough a few years ago in a pastry recipe on a Facebook board. That changed my life. Since then I’ve come up with my own version and I use it all the time. 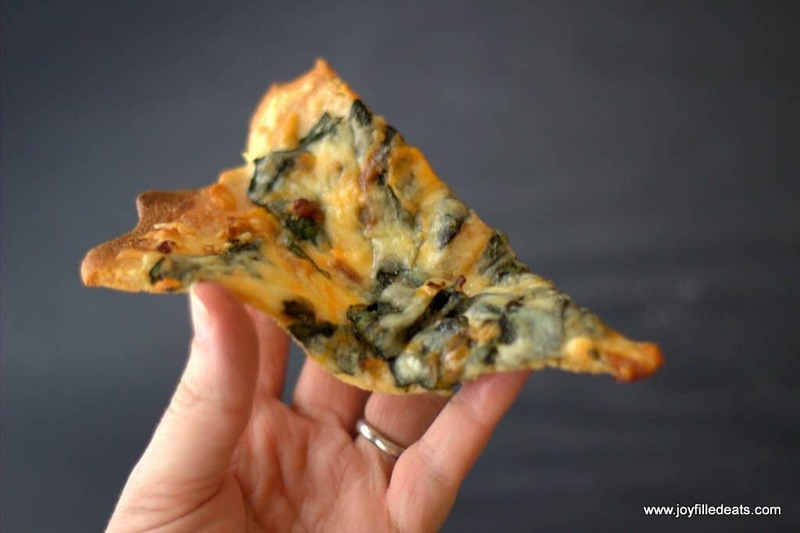 It works in pastries, cookies, flatbreads, breadsticks, and pizzas. Anything that would normally have a thin yeast dough. Since Friday was another meatless Lenten dinner (and I’m out of shrimp) we went vegetarian. 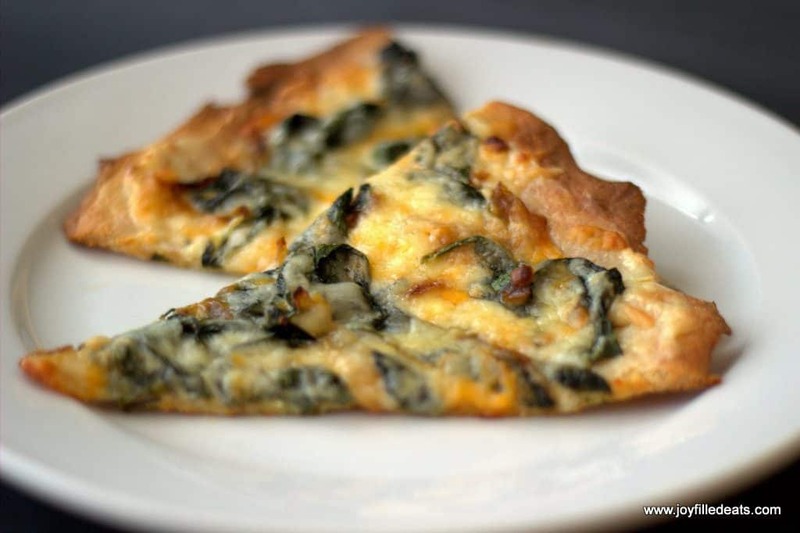 A thin crusted pizza topped with a creamy garlic sauce, caramelized onions, sauteed spinach, and a blend of four different kinds of cheese. 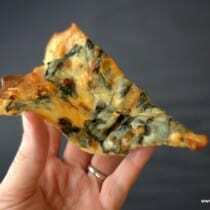 In my opinion, pizza needs to be eaten by picking it up. Having to use a knife and fork just isn’t the same. And since my grandparents owned a NJ pizzeria for many years I think my opinion counts at least a little bit. I used a combination of mozzarella and a blend which has grand cru, Havarti, and sharp cheddar – it was on sale and had a coupon right on the package. It was amazing in this keto pizza. For a nut-free crust click here to go to my friend Maya’s nut-free pizza dough recipe. Put mozzarella cheese and 2 oz of the cream cheese in a microwave-safe bowl. Microwave one minute. Stir. Microwave 30 seconds. Stir. At this point, all the cheese should be melted. Microwave 3o more seconds until uniform and gloopy (it should look like cheese fondue at this point). Mix in the egg and baking mix. 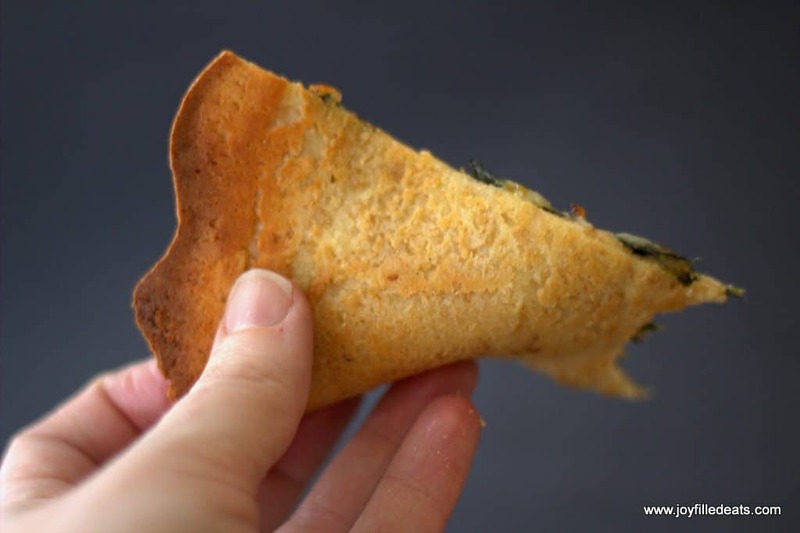 You will need to dump it onto wax paper and knead it by hand to thoroughly incorporate the ingredients or you can do this in a food processor with the dough blade. 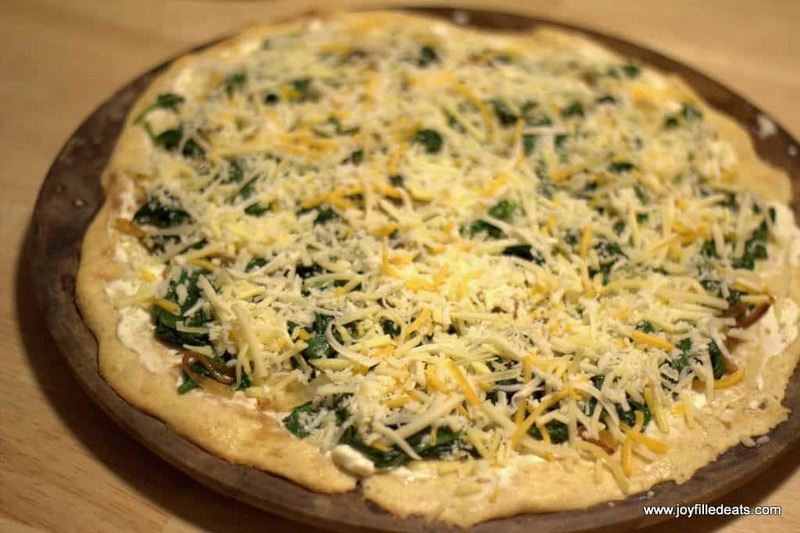 Press or roll into a large circle on a pizza stone using wet hands or a wet rolling pin. Bake on the bottom rack for 20 minutes until golden. Meanwhile, saute onion over medium heat with a little olive oil. 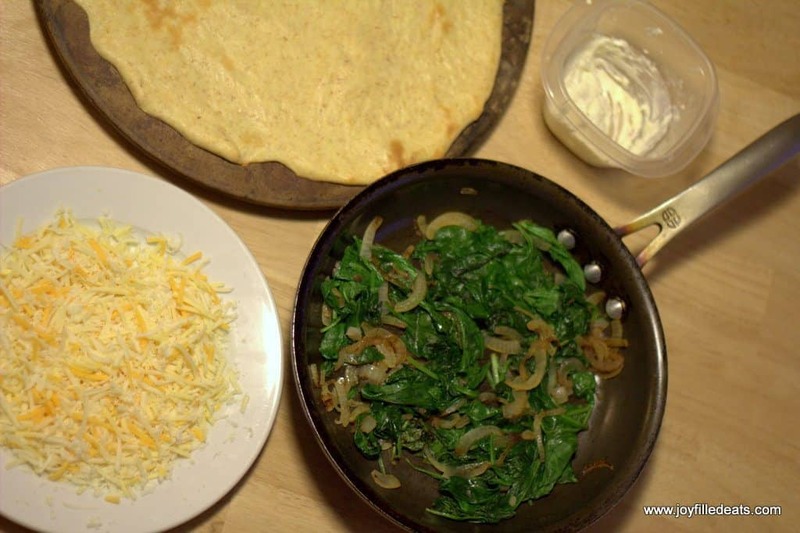 Once it is softened and golden add the spinach. Cover the pan and cook until the spinach wilts. Set aside. Mix the 2 oz of cream cheese with the minced garlic. Set aside. When the crust is golden remove it from the oven. 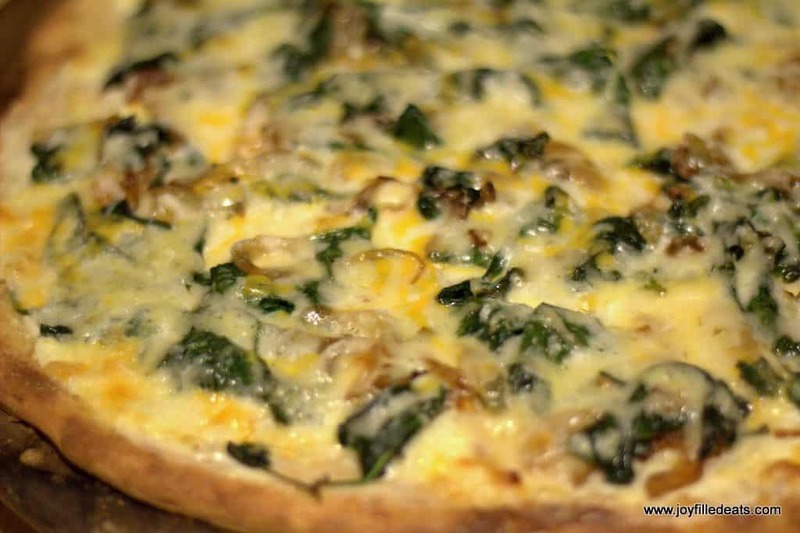 Spread the creamy garlic sauce on, then top with the spinach and onion, and finally sprinkle on the cheese. Bake on the top rack for another 10-15 minutes until the cheese is melted and bubbly. ***For a nut-free crust click here. Has any one used carbalose flour in your recipes? I wonder if it could be used for pizza crust. Not that I know of. Have you used it in fathead dough before? i have an almond allergy. Is there a substitute I could use? I'd suggest using sunflower seed flour. That tastes more like almond flour and isn't as dry as coconut flour. 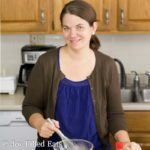 I'm allergic to eggs, has anyone tried to make it with an egg substitute? If so what did you substitute? Any alterations needed? Hi! I just made this and it's delicious. But I was curious if you happen to know if it will freeze well? I have not tried to freeze this yet. If you try let me know how it turns out. I've read and reread, is there approximate nutritional data? I made this today and it was wonderful - first pizza since December!! I just added a nutrition box to the bottom of the post. I noticed on Pinterest you use a baking mix. 1/3 almond flour 1/3 coconut flour and 1/3 golden flax. I have been looking for a flour substitute. Does this exchange for the flour in most recipe? Does it crumble easily? It depends on the recipe. It isn't very crumbly. But that depends on the recipe too. Sorry that's not more helpful! Thank you! I have a canon t3i.